If your child is anything like mine..he/she LOVES to draw. My son is constantly making art, my fridge is covered , my magnet board is covered...what next? •Next start by putting a small amount of glue on the tip of the clothespin..continue gluing and laying down your ribbon as you go around. •Once your letters are dry glue them to your clothespins! Viola! Easy to make, and looks really sweet! Everyone I know is on an "Up-cycling" kick. And why not? Not only is it better for the environment, but it's also almost always a cheaper way to get what you want. Take me for example..I really really wanted a small crafting table. Something that I could put in my room that would look nice, not take up too much room..and have some drawers for storage. I looked everywhere.. The cheapest thing I ended up finding was a small computer desk at Walmart that was press board for $69 in the wrong color. So I decided I would check out local thrift stores..and I did. These are my tips when searching for the furniture you want..very simple easy to remember tips. • Find something built to last. (ie: skip over things that are press board etc) Look for real solid wood. • Find something reasonably priced! Factor in the cost of your item and what you will need to do to get it up to par. • Find something that you can see the potential in. Something that when you close your eyes and look at it..you can picture it where you are going to put it and how it will look. ♥ My desk cost me $20, plus I paid another $7 for new knobs. I used my left over bedroom paint on it, and it looks fabulous! My son LOVES counting down..or counting up to ANYTHING! His birthday is his ( and mine!) most favorite day of the entire year! I was tired of the candy treats each day but still wanted to make it special.. Skill Level: Very easy and quick as well! • Make your photo collage. I did mine myself. However places like Walmart, Cost Co and other photo places are now offering them. My printing cost was $3.00. Make sure you make how many squares you will be counting up to . 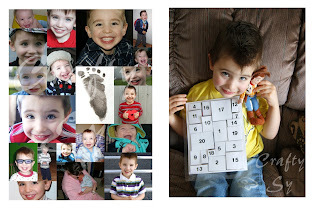 • Using your card stock, start cutting out pieces to match your photo squares. Using a ruler would be best. I just eyed it. 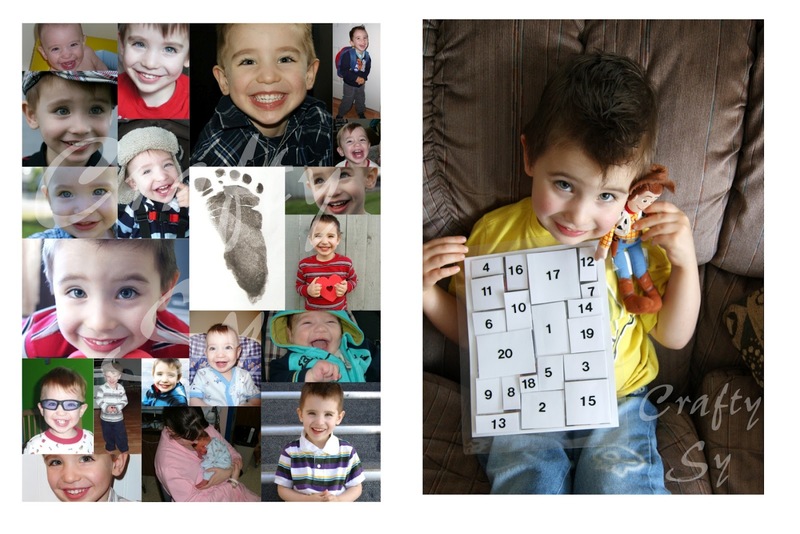 •Add Sticky Tack to the back of your pictures and smoosh them onto your photos. And Viola! There you have it. A keepsake Birthday Count up! Now onto business! 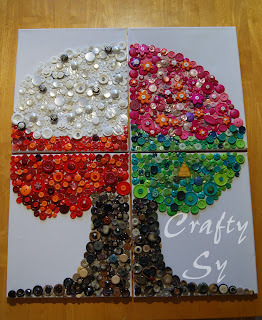 Bottle Cap Magnets! Gah!! These things are really easy to make and SO stinkin' cute! • Trace your circles onto your white paper and the paper you will be using to decorate with. ( I was lucky! My glue stick was the exact right size!) A hole punch would be ideal though! • Use your glue stick and glue the two papers together, like so..
•Flip your bottle cap over and glue your magnet ( with craft glue) to the back. It turned out really well, and took about 30 minutes. I will definitely be doing this again..( and again and again and again). Skill Level: Can you glue buttons :p ? Yes?! You're good to go! • Sketch your letter(s) , cut them out then trace them onto your canvas. • Start adding your buttons, fill up the inside of your letter(s). It's okay if you see spaces! When I craft, I'm messy! • Now start layering your buttons. Cover your spaces! Do it in different areas, in different ways to make your project look unique! And there you have it! Easy Peasy right?! Give it a try! I promise it's fun! !